Acrylic, fiberglass, cast iron, metal and even porcelain tubs can all be improved within a few hours by reglazing them. Dr. Tubs can change the colour, fix any blemishes, repair chips, polish and make your tub look brand new by reglazing it. Our master refinishers spray special paints made specifically for bathtubs, so once the glaze is cured, your tub will look shiny, new and will brighten up your bathroom. The new glaze is in essence a new enamel that will feel smooth to the touch, have a glossy shine and will be easy to clean. Don’t slip in the bathtub. Ask about our no-slip surface that looks like the rest of the shiny tub, but doesn’t allow you to slip and fall. Our no-slip surface is much easier to clean than other systems and it’s built into the glaze. If the bath isn’t broken, why throw it out with the bath water? In other words, there is no reason to get rid of the tub if it’s structurally sound. If it looks dull and dated, then bring it back to life by reglazing it, not by replacing it. It is much easier to reglaze the tub then to replace it. When reglazing, nothing is removed, other than the over-flow drain cap. If you replace the tub, you would have to remove the heavy tub, possibly the old drain pipes and at least one row of tiles. You may have to remove some dry wall, waterproof boarding etc. Don’t forget, this may take days or weeks to do and could require a plumber and a tile setter, in addition to a general contractor. Reglazing takes a few hours, where replacing could take a few days or weeks. Reglazing is a fraction of the cost of replacing. There is far less mess with reglazing than with replacing and our highly trained technicians will tidy up afterwards. If you are looking at changing the colour of the bathtub to make it look new or to spruce up the bathroom, it can easily be done with reglazing. They don’t make tubs like they used to! This is a known fact for many things nowadays. So why throw out an old cast iron or metal tub for a cheap fiberglass one? Did you know that cast iron was used exclusively in the manufacturing of bathtubs as iron keeps heat in better than any other metal? The equivalent type tub now would cost you 3 to 4 times as much, or more. The older, antique, claw foot or slipper tubs are back in fashion and if you have one, keep it, reglaze it and love it. When remodeling or renovating a bathroom it maybe difficult to find the same size bath as you were using. If you kept your bath and reglazed it after the renovations, there would be no issues with size. It already fits! 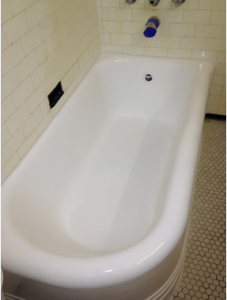 Often, an older, stronger tub is replaced with an acrylic or fiberglass tub. (You may have paid more money for an inferior product.) Then during the retiling process, a tile is dropped on the tub and chips it or makes a hole in the tub. The best solution is now to replace the entire tub as patching the hole / chip is just that, a patch. If something happens to a reglazed tub, it can easily be fixed in a short amount of time and the cost is negligible compared to replacing the tub again. It’s so easy to clean and maintain a reglazed tub. Most common types of bathtubs can be reglazed. A no-slip surface can be put on the floor of the tub to make it safe, without the cheap look of strips, stickers and yucky mats that can cause molding and rust. Bring your bathtub and bathroom back to life with reglazing, not replacing! Call Dr. Tubs Reglazing now at 416-630-9143. Bathtub reglazing, remodeling, renovation professional in Toronto, Ontario. Dr. Tubs Reglazing can colour, fix any blemishes, repair chips, polish and make your tub look brand new by bathtub resurfacing .